It was a great pleasure to feature in BIKU DESIGN's June Japan Dialogue blog. Victoria Close interviewed me in a novel way with a glass of pinot in hand, over Messenger App which made it very inspirational and unrehearsed. I was asked about my past growing up in New Zealand and my journey from Tour Guide to Corporate Lawyer to taking the big jump to being a business-owner in Tokyo launching as a Lawpreneur. I pulled out some photos from my memory box to give to Victoria to supplement the blog text, and in doing that the whole interview experience turned out to be a really wonderful way for me to reflect on my well-lived and blessed life bridged over two countries and always surrounded by loving friends & family, colleagues & clients. *** BIKU DESIGNS *** is owned and operated by Victoria Close. She personally sources vintage kimono, reimagined into one-of-a-kind jewelry pieces. They are wearable pieces of history. The items are truly one-off and very beautiful. I've taken pieces back to New Zealand as gifts for friends and family. Check out Biku Designs on Instagram, Facebook and on Twitter and you will keep going back! ***Do you like the photo I used for this Blog? 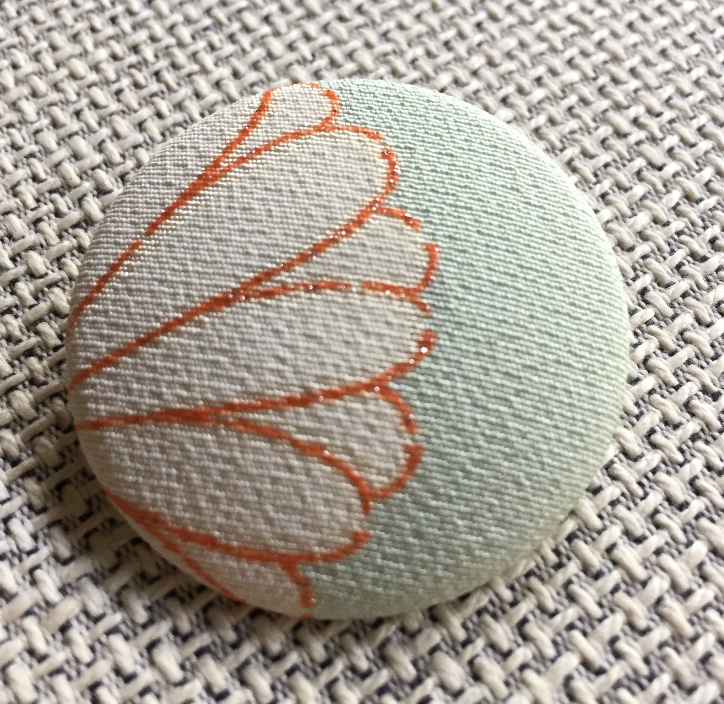 It's a kimono pin (or brooch) that I bought from Biku Designs. It's a pretty teal blue with off-white chrysanthemum motif and just a hint of gold fleck stitching for effect, woven through the orange borders of the petals. It is light and easy to wear on my jackets and dresses. Since Victoria's creations are "wearable pieces of history", I've been wondering who wore the kimono this material came from and that mysterious part makes this special piece of jewelery that much more unique and intriguing for me!